Shrink Sleeve Applicator also known as heat shrink sleeving labeler, specifically been designed to make systematic and packaging and labeling performance as pack per minute ratios. This shrink sleeve applicators are been used in the different industries like pharmaceuticals, food industry, cosmetic industry etc. The usage of this is increasing tremendously as well as there is a high demand with this machinery. On the basis of technology, Shrink Sleeve Applicator has been segmented as Hand-held Label Applicators, Manual Label Applicator, Semi-Automatic Label Applicator, Automatic label applicator. There is a high demand of Shrink Sleeve Applicator and Filling Line products which can be explained as follows. Nowadays, everything has been turned into packaging. It has now became a mindset of the people that everything comes in packaging is having a good quality. For a manufacturer, or businessman it necessary to do with the marketing analysis of the product that has to be launched. Where packaging of the product is must so as to gain consumers. Considering with the market research and challenging trends there is a rise in demand for Shrink Sleeve Applicator as well as fill line products in different countries including Thailand, Canada, Bangladesh, Kenya and many more countries. Due to increase of food industry and beauty products there is increase in demand with the shrink sleeve applicator. Shrink Sleeve Applicator is used for accurate, smooth, & high speed operations . This are very time efficient giving a high performance product range ensuring cost effective results. There are also some of the features of the shrink sleek applicator which is raising its demand. It is easy to install and very low maintenance, also easy to manage by setting the body into half full body, half body, cap of the bottle. There is upsurge demand for packaging machinery for manufacturers towards branding and promotion of the packaged product. Rise in population growth also expect to contribute substantially to the market’s growth. The shrink sleeve applicator is projected to stay positive during the forecast period. Considering with the above factors the different industry like pharmaceuticals, food industry, and cosmetic industry have a good market growth in future. 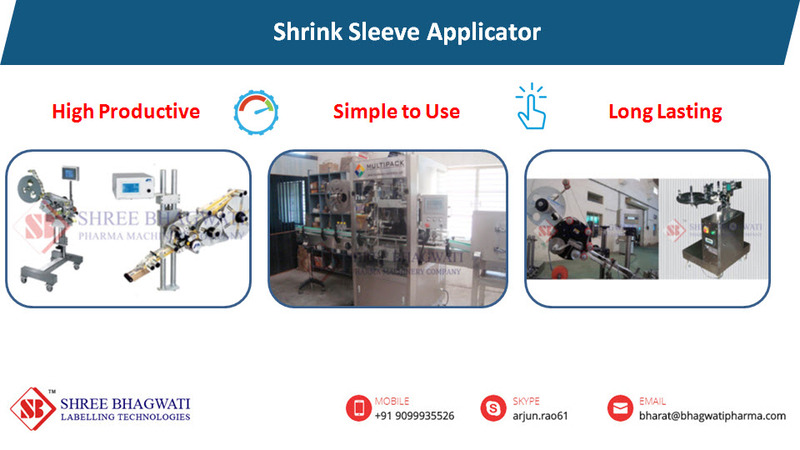 Bhagwati offers you a wide range of Shrink Sleeve Applicators which produces a great output ranging from 50-600 pieces/min with a sleeve thickness of 30-50 microns. One of the advantage is the machine has got low power requirements giving higher corresponding efficiency that is profitable for manufacturers and exporters.